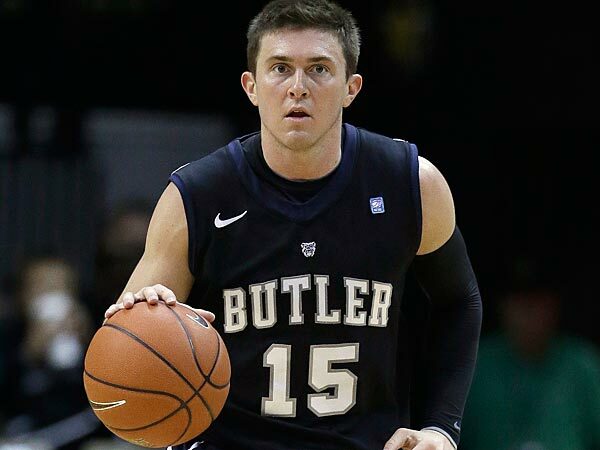 PHILADELPHIA – The Butler Bulldogs (#14 AP/#17 USA Today) were led by the senior duo of Rotnei Clarke and Andrew Smith, who scored 28 and 24 points, respectively, in the Bulldogs’ first official Atlantic 10 Conference game, culminating in a 72-66 win over Saint Joseph’s (8-5, 0-1 Atlantic 10). The Bulldogs (13-2, 1-0 Atlantic 10), who entered the court to jeers from the Hawks’ student section, withstood a barrage of 3-pointers from St. Joe’s, which scored 8 of 13 in the first half. The Hawks led 40-35 at the half. The second half was a different story as the Bulldogs held Saint Joseph’s without a field goal for a 9-minute stretch. Rotnei Clarke hit six 3-pointers, fueled by the boos that roared from the crowd every time he touched the ball. Saint Joe’s twice came within one possession of the Bulldogs during the closing minutes, but failed to take the lead. This was the first meeting between Butler and St. Joseph’s since the 1940-41 season. Butler next travels to Dayton on Saturday.